When you are ordering from us or any of our partner sites, please keep in mind that we make everything to order. We don't have products sitting on a shelf that we can take and ship immediately. Every package has to be put together when we receive an order - We do this to ensure the freshest product possible. Because of this, we can't turn out an order in an hour. When we receive your order, we will normally ship it within 24 hours or we will ship it to arrive as close as possible to the date you request. If there is a delay, you will be notified. Ground - Shipping days vary depending on how far you are from us. Please refer to the chart below. We are in Burbank, California (suburb of Los Angeles). 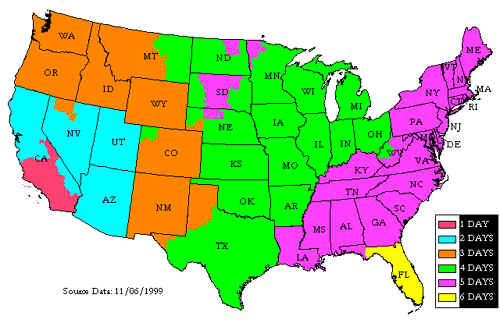 If we were to ship a package on Monday to the State of Washington (in orange), it would take 3 business days and arrive on Thursday. If we were to ship on Monday to the East Coast, it would arrive the next Monday (5 business days). PLEASE NOTE: WE DO NOT GUARANTEE SHIPPING CHOCOLATE PRODUCTS USING STANDARD GROUND DURING THE SUMMER. THE HEAT WILL MELT THE CHOCOLATE. WE ADVISE THAT YOU UPGRADE YOUR SHIPPING TO 2ND DAY AIR. Shipping & handling charges are calculated based upon the total dollar volume of your order. When you check out, you will be given the following shipping options: STANDARD GROUND, SECOND DAY, NEXT DAY - OVERNIGHT, SATURDAY DELIVERY and AK HI PR SECOND DAY and you will be shown the calculated shipping charge.